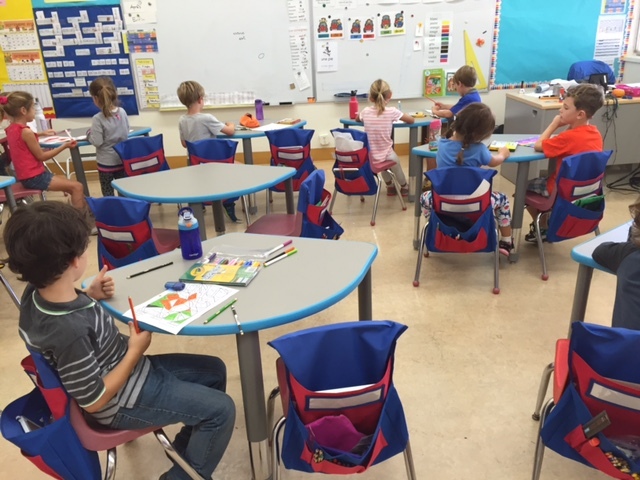 In 1st grade A, regular desks have been removed from the classroom. We now have “collaborative desks” which allow students to work individually, with another student or in group of four or more. These desks are easy to move and groups of students can be in a large circle or half circle depending on the activity offered by the teacher. Since there is no box under the new desks, student now have some of their supplies in a special holder hung on their chairs. In the future, more classroom will be organized this same way in order to promote different learning situations.